The image above shows the Osprey Prototype Turbine test rig, a 30ft aluminium catamaran manufactured by Able Engineering. 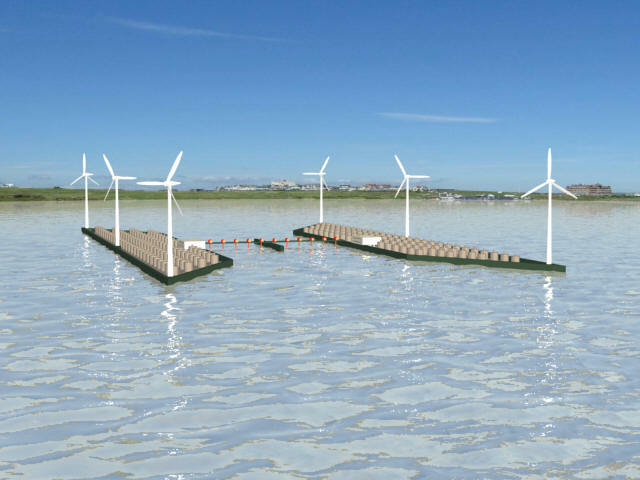 The OHEG is a revolutionary hybrid concept using the tide to produce energy. 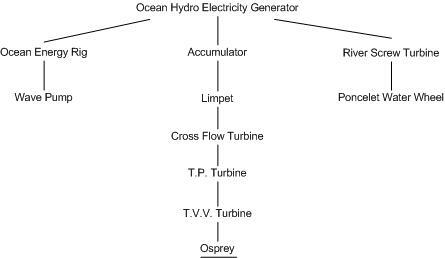 The power is produced by using both the kinetic energy in tidal flow and the potential energy created by tidal height changes, utilising offshore storage lagoons to retain the mass of water. The structure is fixed to the sea bed and the water velocity is increased by incorporating a venturi arrangement. See below an artist impression of a 10MW system. The OER is another hybrid concept harnessing tidal stream with increased velocity from a venturi system, wave and wind power. This system is floating and anchored to the sea bed, being brought back to dock for servicing or repair. Below is an artist impression of a prototype.